ISLAMABAD, Oct 18 (APP)::Prime Minister Shahid Khaqan Abbasi on Wednesday said that Karachi was the economic hub of Pakistan and it was a collective target to make the city of lights the center of peace and prosperity. The prime minister was talking to a delegation of MQM – Pakistan, headed by D.Farooq Sattar, which called on him here at the PM Office here. Other members of the delegation included Amir Khan, Kanwar Naveed, Waseem Akhtar and Kamran Tesoori. Interior Minister Ahsan Iqbal, Minister for Railways Khawaja Saad Rafique, Sindh Governor Muhammad Zubair, Senator Saleem Zia and President PML-N Karachi division Munawar Raza were also present in the meeting. 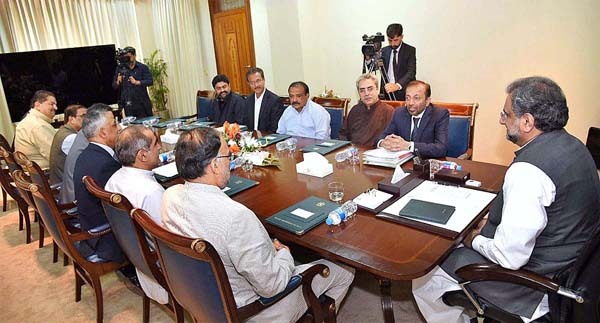 The prime minister said the federal government had approved a record development package for Karachi and all promises, in that connection, made by former prime minister Nawaz Sharif would be fulfilled. The meeting reviewed the Prime Minister’s Development Package for Karachi and Hyderabad and decided that release of funds for the gigantic project would be ensured in the current year. It was also decided that work on the project would be initiated immediately. It was decided that Prime Minister Shahid Khaqan Abbasi would lay the foundation stone of Hyderabad University in November, 2017. The MQM delegation complained about non-cooperation of the Sindh government regarding the Karachi Metropolitan Corporation (KMC), which was not only affecting performance of the civic body but also mitigating problems of the dwellers of the city. The prime minister said the government respected all sorts of elected democratic institutions and the local bodies had a vital role for uplift of the country. He said the provincial government’s attention would be drawn in this connection as people’s participation was a must for continuity of democracy. The meeting agreed to maintain peace in Karachi at all costs. It was unanimous that all democratic forces should shun differences and play their role for strengthening of democracy. It said that the supremacy of Constitution and the continuity of democratic process was essential for progress, prosperity and stability of Pakistan. It said that solution to all problems were linked with the supremacy of Constitution, law and the parliament. The prime minister directed the interior minister to review complaints of the MQM-Pakistan regarding trials and to ensure dispensation of justice.